Inspired by Matthew: 25, this sculpture is a representation that suggests Christ is with the most marginalized in our society. The Christ figure is shrouded in a blanket the only indication that it is Jesus is the visible wounds on the feet. 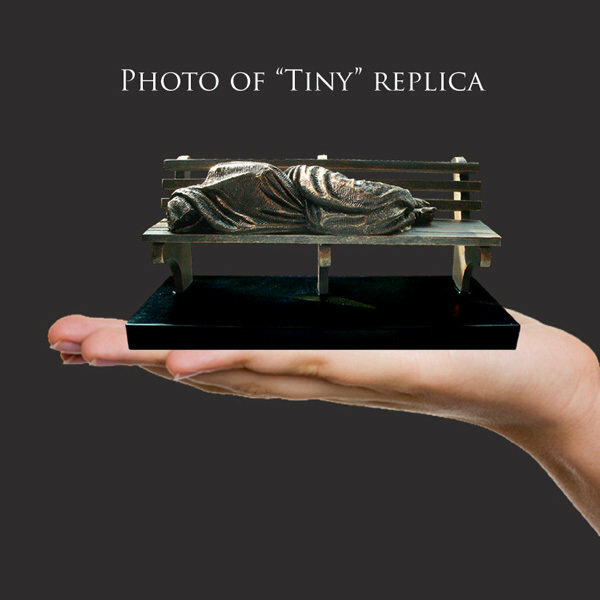 The life-size version of the work has enough room that someone is able to sit on the bench. This solid resin-stone cast is coated in a realistic bronze finish and is mounted on a solid matt black base. Timothy personally sculpts every original small masterpiece complete with his signature or monogram. Each replica is detailed by hand to the exacting standards of this modern day master sculptor.